Dr. Shigeki Goto is a professor at Department of Computer Science and Engineering, Waseda University, Japan. He received his B.S. and M.S. in Mathematics from the University of Tokyo. 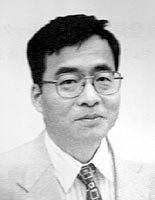 Prior to becoming a professor at Waseda University, he has worked for NTT for many years. He also earned a Ph.D in Information Engineering from the University of Tokyo. He is a computer scientist and an editor of "New Generation Computing" (Ohm-sha and Springer-Verlag). He is a member of ACM and IEEE, and a trustee of Internet Society from 1994 to 1997. In addition to authoring several textbooks on LISP and PROLOG, Dr. Goto has also translated several books including "An Introduction to TCP/IP" (by John M. Davidson) and "STACKS" (by Carl Malamud). The latter translation work is reported in "Exploring the Internet -- A Technical Travelogue (by Carl Malamud).